DIE Lunæ, videlicet, 16 die Maii. Bucks Militia will be ready next Monday. Hampshire Militia will be ready at Whitsuntide. St. Gregory's Church to be built. Letter from the King to the Speaker, with a Message about the Bill for raising 10,000 Men for Ireland. Sir Robert Mansell and Briscoe. Message from the H. C. to amend the Impeachment against Judge Berkley. Asser, &c. and the E. of Sussex about a Fishery in Essex. Message from the H. C. with an Answer to the King's Message, and a Declaration of both Houses. 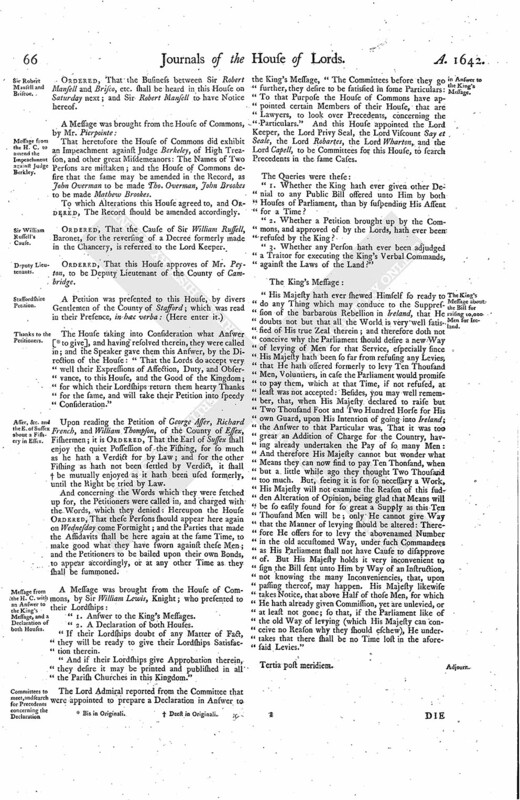 Committees to meet, and search for Precedents concerning the Declaration in Answer to the King's Message. The King's Message about the Bill for raising 10,000 Men for Ireland. Letter from York to the Speaker, dated the 13th of May, 1642. Message from the H. C. for a Conference about Letters from York. Message to the H. C. that the Lords will communicate all Letters of which the Commoners have not Duplicates. 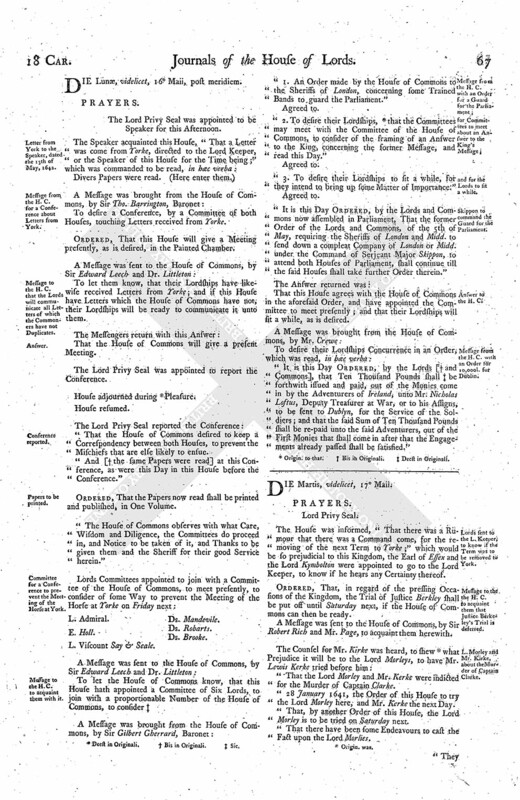 Committee for a Conference to prevent the Meeting of the Horse at York. Skippon to command the Guard for the Parliament. Message from the H. C. with an Order for 10,000£. for Dublin. The Lord Privy Seal was appointed to sit as Speaker this Day. The Lord Paget reported to this House, "That the County of Bucks will be ready to put the Ordinance of the Militia into Execution this Day Sevennight; and the Lord Paget desired Leave to be present there himself, to see it done accordingly;" which this House Ordered. The Earl of Pembrooke acquainted this House, "That Hampshire will be ready to put the Ordinance of the Militia into Execution by Whitsontide next;" which this House Ordered the same accordingly. Ordered, That the Parish Church of St. Gregories, near St. Paul's Church, shall (fn. 1) be (fn. 2) speedily built; for this Purpose, a Thousand Pounds shall be borrowed out of the Monies received for the repairing of St. Paul's, remaining now in the Chamber of London, for to be employed for that Purpose. Right Trusty and Well-beloved Counsellor, We greet you well. Our Will and Command is, That you forthwith deliver, to be read in Our House of Peers, and afterwards communicated to Our House of Commons, Our Message inclosed, concerning a Bill sent from Our said Parliament, by Way of an Instruction, for levying within this Our Kingdom Ten Thousand Men, for the Service of Ireland; for which this shall be your Warrant. "Given at Our Court at Yorke." Yorke, the 13th of May, 1642. Ordered, That this Letter, with the Message inclosed, shall be communicated presently to the House of Commons; and accordingly it was sent down to the House of Commons, by Sir Edward Leech and Doctor Littleton. Ordered, That the Business between Sir Robert Mansell and Brisco, etc. shall be heard in this House on Saturday next; and Sir Robert Mansell to have Notice hereof. That heretofore the House of Commons did exhibit an Impeachment against Judge Berkeley, of High Treason, and other great Misdemeanors: The Names of Two Persons are mistaken; and the House of Commons desire that the same may be amended in the Record, as John Overman to be made Tho. Overman, John Brookes to be made Mathew Brookes. To which Alterations this House agreed to, and Ordered, The Record should be amended accordingly. Ordered, That the Cause of Sir William Russell, Baronet, for the reversing of a Decree formerly made in the Chancery, is referred to the Lord Keeper. Ordered, That this House approves of Mr. Peyton, to be Deputy Lieutenant of the County of Cambridge. The House taking into Consideration what Answer [ (fn. 4) to give], and having resolved therein, they were called in; and the Speaker gave them this Answer, by the Direction of the House: "That the Lords do accept very well their Expressions of Affection, Duty, and Observance, to this House, and the Good of the Kingdom; for which their Lordships return them hearty Thanks for the same, and will take their Petition into speedy Consideration." Upon reading the Petition of George Asser, Richard French, and William Thompson, of the County of Essex Fishermen; it is Ordered, That the Earl of Sussex shall enjoy the quiet Possession of the Fishing, for so much as he hath a Verdict for by Law; and for the other Fishing as hath not been settled by Verdict, it shall (fn. 5) be mutually enjoyed as it hath been used formerly, until the Right be tried by Law. And concerning the Words which they were fetched up for, the Petitioners were called in, and charged with the Words, which they denied: Hereupon the House Ordered, That these Persons should appear here again on Wednesday come Fortnight; and the Parties that made the Affidavits shall be here again at the same Time, to make good what they have sworn against these Men; and the Petitioners to be bailed upon their own Bonds, to appear accordingly, or at any other Time as they shall be summoned. "1. Answer to the King's Messages. "2. A Declaration of both Houses. "If their Lordships doubt of any Matter of Fact, they will be ready to give their Lordships Satisfaction therein. "And if their Lordships give Approbation therein, they desire it may be printed and published in all the Parish Churches in this Kingdom." 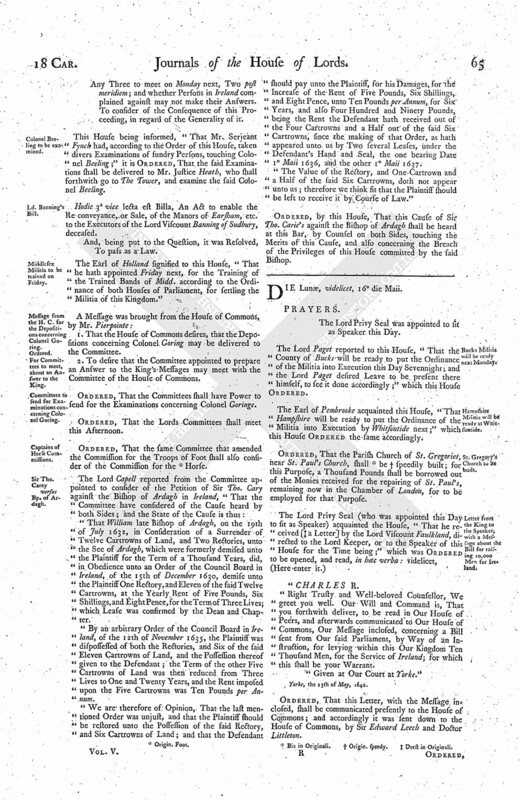 The Lord Admiral reported from the Committee that were appointed to prepare a Declaration in Answer to the King's Message, "The Committees before they go further, they desire to be satisfied in some Particulars: To that Purpose the House of Commons have appointed certain Members of their House, that are Lawyers, to look over Precedents, concerning the Particulars." And this House appointed the Lord Keeper, the Lord Privy Seal, the Lord Viscount Say et Seale, the Lord Robartes, the Lord Wharton, and the Lord Capell, to be Committees for this House, to search Precedents in the same Cases. "1. Whether the King hath ever given other Denial to any Public Bill offered unto Him by both Houses of Parliament, than by suspending His Assent for a Time? "2. Whether a Petition brought up by the Commons, and approved of by the Lords, hath ever been refused by the King? "3. Whether any Person hath ever been adjudged a Traitor for executing the King's Verbal Commands, against the Laws of the Land?" "His Majesty hath ever shewed Himself so ready to do any Thing which may conduce to the Suppression of the barbarous Rebellion in Ireland, that He doubts not but that all the World is very well satisfied of His true Zeal therein; and therefore doth not conceive why the Parliament should desire a new Way of levying of Men for that Service, especially since His Majesty hath been so far from refusing any Levies, that He hath offered formerly to levy Ten Thousand Men, Voluntiers, in case the Parliament would promise to pay them, which at that Time, if not refused, at least was not accepted: Besides, you may well remember, that, when His Majesty declared to raise but Two Thousand Foot and Two Hundred Horse for His own Guard, upon His Intention of going into Ireland; the Answer to that Particular was, That it was too great an Addition of Charge for the Country, having already undertaken the Pay of so many Men: And therefore His Majesty cannot but wonder what Means they can now find to pay Ten Thousand, when but a little while ago they thought Two Thousand too much. But, seeing it is for so necessary a Work, His Majesty will not examine the Reason of this sudden Alteration of Opinion, being glad that Means will be so easily found for so great a Supply as this Ten Thousand Men will be; only He cannot give Way that the Manner of levying should be altered: Therefore He offers for to levy the abovenamed Number in the old accustomed Way, under such Commanders as His Parliament shall not have Cause to disapprove of. But His Majesty holds it very inconvenient to sign the Bill sent unto Him by Way of an Instruction, not knowing the many Inconveniencies, that, upon passing thereof, may happen. His Majesty likewise takes Notice, that above Half of those Men, for which He hath already given Commission, yet are unlevied, or at least not gone; so that, if the Parliament like of the old Way of levying (which His Majesty can conceive no Reason why they should eschew), He undertakes that there shall be no Time lost in the aforesaid Levies." The Lord Privy Seal was appointed to be Speaker for this Afternoon. To desire a Conference, by a Committee of both Houses, touching Letters received from Yorke. Ordered, That this House will give a Meeting presently, as is desired, in the Painted Chamber. To let them know, that their Lordships have likewise received Letters from Yorke; and if this House have Letters which the House of Commons have not, their Lordships will be ready to communicate it unto them. That the House of Commons will give a present Meeting. The Lord Privy Seal was appointed to report the Conference. House adjourned during (fn. 6) Pleasure. That the House of Commons desired to keep a Correspondency between both Houses, to prevent the Mischiefs that are else likely to ensue. "And [ (fn. 7) the same Papers were read] at this Conference, as were this Day in this House before the Conference." Ordered, That the Papers now read shall be printed and published, in One Volume. "The House of Commons observes with what Care, Wisdom and Diligence, the Committees do proceed in, and Notice to be taken of it, and Thanks to be given them and the Sheriff for their good Service herein." L. Viscount Say & Seale. Ds. Mandevile. "1. An Order made by the House of Commons to the Sheriffs of London, concerning some Trained Bands to guard the Parliament." "2. To desire their Lordships, (fn. 9) that the Committees may meet with the Committee of the House of Commons, to consider of the framing of an Answer to the King, concerning the former Message, and read this Day." "3. To desire their Lordships to sit a while, for they intend to bring up some Matter of Importance." "It is this Day Ordered, by the Lords and Commons now assembled in Parliament, That the former Order of the Lords and Commons, of the 5th of May, requiring the Sheriffs of London and Midd. to send down a compleat Company of London or Midd. under the Command of Serjeant Major Skippon, to attend both Houses of Parliament, shall continue till the said Houses shall take further Order therein." That this House agrees with the House of Commons in the aforesaid Order, and have appointed the Committee to meet presently; and that their Lordships will sit a while, as is desired. "It is this Day Ordered, by the Lords [ (fn. 10) and Commons], that Ten Thousand Pounds shall (fn. 11) be forthwith issued and paid, out of the Monies come in by the Adventurers of Ireland, unto Mr. Nicholas Loftus, Deputy Treasurer at War, or to his Assigns, to be sent to Dublyn, for the Service of the Soldiers; and that the said Sum of Ten Thousand Pounds shall be re-paid unto the said Adventurers, out of the First Monies that shall come in after that the Engagements already passed shall be satisfied."